I posted a recipe for my macaroni cheese a little while ago. It’s a firm family favourite in the Bangers & Mash household. But I also had to bring you this version. It’s not my recipe. It’s from the acclaimed Australian chef Neil Perry’s Rockpool Bar & Grill; a beautiful tome of a cookbook, as much a coffee table book as a practical guide for the kitchen. If I actually had a coffee table, this would certainly take pride of place on it. I received the cookbook courtesy of Qantas, who as well as offering flights to Australia are passionate about spreading the word about Australian food. In addition to running restaurants in Sydney, Melbourne and Perth , Neil Perry is the chief consulting chef for Qantas. The recipes in Rockpool Bar & Grill are more aspirational than every day; the kind of dishes I’d probably only attempt if I were cooking for a special dinner party. Not surprising though as the aim of the book is to show you how to create restaurant-style dishes at home. It’s impossible to stop your mouth from watering as you turn the pages, which also provide a behind-the-scenes account of life in the Rockpool restaurants, as well as stories about the producers and suppliers who inspire Neil Perry’s menus. Pasta and cheese is the best combo. My daughter Josephine can polish one of these off for dinner any night of the week. I first started making this years ago. I loved going to America and having mac ‘n’ cheese, more often than not at steakhouses. I began with a recipe from a great friend and truly one of the world’s great chefs, Thomas Keller of The French Laundry and Per Se. If you start with that kind of pedigree, you’re going to end up with a great dish, and a great dish I did end up with. It’s a perfect marriage with a good steak but is equally at home with all of the other meats and poultry we serve at the restaurant. Use good cheese, really good quality hard Italian pasta and a smoky bacon. Your efforts will be well rewarded. I was curious to see how different restaurant-style macaroni cheese would be from what we usually make. And I have to say it is very good. Very, very good actually. My husband and the girls wolfed it down greedily and it really does work well with a decent steak. We enjoyed ours with griddled sirloin and a simple salad instead of our usual Sunday roast, and it was a rather special meal indeed. Oh, and there’s are some heavenly-looking lemon meringue cupcakes in there that I’m pretty sure I’ll be having a go at very soon too. Cook the macaroni in a large saucepan of boiling salted water until al dente. Drain and refresh in iced water. Drain again and place in a large bowl. Heat the olive oil in a saucepan over a medium heat. Add the bacon and cook until golden. Drain on paper towel, then add to the macaroni. Return the pan to the heat, add the cream, bring to the boil, then reduce the heat and simmer for 5 minutes or until thickened. Remove from the heat and gradually add the Cheddar and Gruyère, stirring until melted. Combine the garlic, paprika and mustard to form a paste, then stir into the cream mixture. Season to taste with salt and pepper. Add to the macaroni mixture and stir through. Heat a grill to high. Divide the mixture between individual heatproof bowls or a 1.5 litre capacity baking dish. Sprinkle over the Parmesan, then the breadcrumbs. Grill until the top is golden. Disclosure: Qantas provided me with a complimentary copy of Rockpool Bar & Grill for review purposes. No money exchanged hands and all opinions are totally my own. Having read how important the bacon is to the flavour of this dish… I’m still going to try it without, I’m afraid. 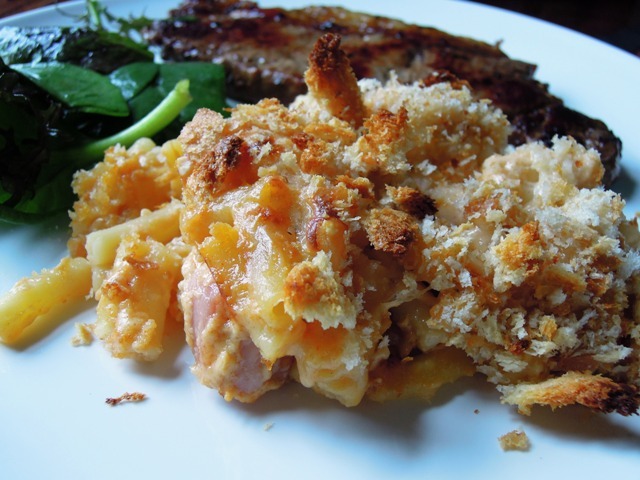 Cheesy macaroni is a big favourite here and this recipe sounds too good to miss out on! 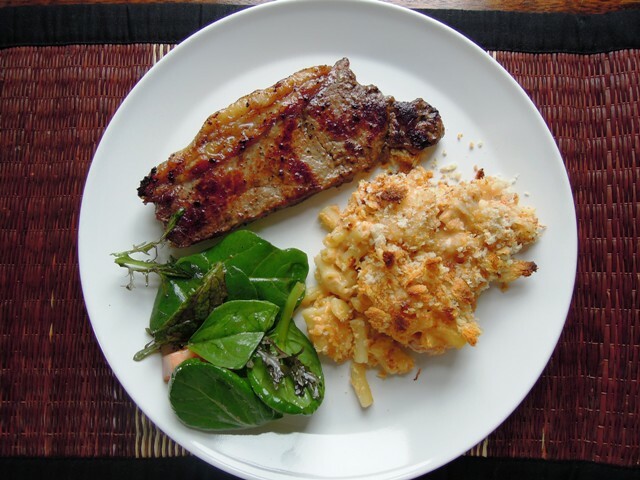 Wouldn’t of thought of putting macaroni cheese together with steak and salad but it looks like a great meal. Keen to give this version a go, and rethink what I have with it. Love your title and love the combo you served it with. Thanks Bintu.I’d never have thought to serve macaroni cheese with steak but it does work very well. Now that certainly does sound like posh Macaroni Cheese! Heavenly indeed. Though I’m still a little sore that my daughter simply will not eat it in any shape or form. Nor anything with cheese sauce (though she annoyingly adores cheese). 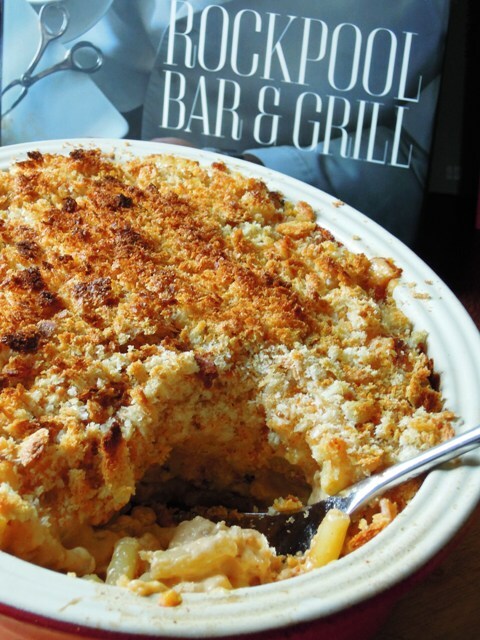 So Mac Cheese, my ultimate comfort food since childhood rarely gets made. I might just brave an attempt again though with this recipe…..